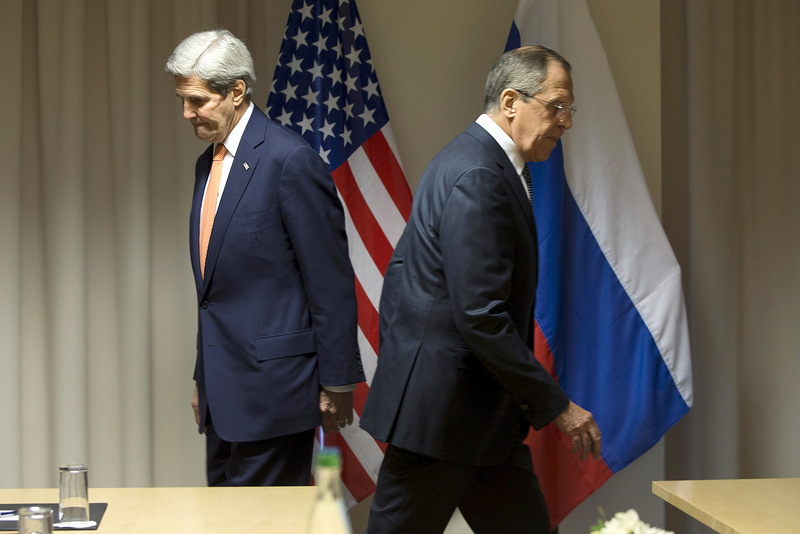 U.S. Secretary of State John Kerry and Russian Foreign Minister Sergey Lavrov walk to their seats for a meeting about Syria, in Zurich, Switzerland, Jan. 20, 2016. The U.S. has announced the termination of dialogue with Russia on Syria, blaming Moscow for not helping to sustain the ceasefire. RBTH presents three possible scenarios for the development of the situation in Syria following the decision by the White House. The situation in Syria continues to develop in alarming new directions, with the latest breakdown in communication between Moscow and Washington creating a very real possibility that U.S. and Russian forces may come into conflict in the region. The U.S. Department of State announced on Oct. 3 it is suspending its participation in bilateral channels with Russia over Syria, accusing Moscow of violating its commitments to halt fighting and ensure aid reached people in besieged areas under the ceasefire agreement that came into effect on Sept. 12 but is now effectively dead. In turn, the Russian Foreign Ministry accused Washington of being willing "to make a deal with the devil" – meaning Islamic extremists – only for the sake of bringing about regime change in Damascus. How could events develop now in the absence of U.S.-Russian dialogue and what are the potential scenarios? This possibility and the desire to avoid it lie at the heart of all talks between the heads of the U.S. and Russian foreign policy departments over Syria, said Alexander Perendzhiyev, a military analyst from the Plekhanov University of Economics in Moscow. This is the main goal pursued by the two powers, since otherwise they will have no common ground on Syria. In these circumstances, taking into account the latest step of Washington, said Perendzhiyev, a military conflict is possible between Russia and the U.S. in Syria. "Moreover, it has already occurred indirectly: The Americans shelled and bombed the Syrian government forces' units, where our military advisers were present; the Russian side bombed terrorists, among whom there were Americans," he told the Russian news agency RIA Novosti. In the former case, Perendzhiyev was referring to the recent mistaken shelling () of Syrian President Bashar al-Assad's forces by aircraft from the U.S.-led coalition forces, and in the latter, a Russian strike on the U.K.-U.S. military base in Syria in June. However, the scenario of military confrontation between Moscow and Washington in Syria is still unlikely. As Vladimir Sotnikov from the Institute of Oriental Studies stressed in an interview with RBTH, the U.S. military has left channels of communication to avoid conflicts between military aircraft of the two countries, despite having suspended cooperation with Russia on Syria. This is an indication that the U.S. is trying to prevent any military clashes between the two countries. U.S. Secretary of State John Kerry previously mentioned a certain "Plan B," speaking of it as an alternative to the stalled peace process. As Alexander Shumilin, director of the Center for the Analysis of Middle East Conflicts at the Institute for U.S. and Canadian Studies, told RBTH, the "Plan B" now involves the "strengthening of the anti-Assad and anti-ISIS opposition." This task will fall to the Arab monarchies and Turkey with Washington's consent. At the same time, said Shumilin, groups such as the Al-Nusra Front, which is designated by the U.N. and U.S. as terrorist, will continue to be armed. In other words, all the forces that are opposed to President Assad will be mobilized. This, of course, will only lead to increased fighting and heavier casualties, since Assad's allies, primarily Russia, are not going to retreat. Russian presidential spokesman Dmitry Peskov has already said that Moscow will not give up its fight against “terrorism” and its support for the Syrian authorities. Russia in Syria one year on: What has been achieved? Under the same scenario, Washington may try to bring down the Syrian president's regime by force, employing aircraft under the model of the operation in Libya in 2011, when Colonel Gaddafi lost power and was killed. However, in this case, a direct clash is inevitable with the Russian air force, which is protecting Syrian army positions from air attacks, Mikhail Vladimirov of the Center for Military and Political Studies at the Moscow State Institute of International Relations pointed out in an interview with RBTH. This makes this option unlikely due to Washington's unwillingness to take risks – the unpredictable consequences of such clashes between two powers possessing nuclear weapons are obvious. At the same time, according to Vladimirov, pumping resources into supplying the enemies of Assad is pointless because the opposition already hardly needs anything, getting the necessary weapons and money. Additional assistance cannot change the balance of forces in the conflict as long as the air is dominated by Russian aircraft, which are doing all they can to destroy rebel resistance. Freed from the constraints of the peace agreements after Washington's decision, Assad's troops, supported by Russia, can achieve significant successes, flushing their opponents out of Aleppo, despite the assistance being provided to them by Washington and its allies. Once control over this extremely important Syrian city is obtained, Vladimirov said, the Syrian army will begin an offensive in Idlib province. Victory for Assad will be determined by the position of the Sunni groups.